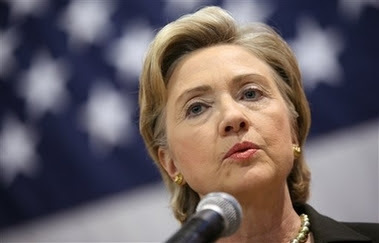 PERRY, Iowa - Hillary Rodham Clinton maintained Sunday that she's the best candidate to win against Republicans, saying she has more experience battling the GOP than any other candidate in the Democratic field. "I believe that I have a very good argument that I know more about beating Republicans than anybody else running. They've been after me for 15 years, and much to their dismay, I'm still standing," she said in answer to a woman's question about her electability. "I'm leading in all the polls, I'm beating them in state after state after state." Hmmmm... That may be a bit of a stretch..... Newsmax has this little story that caught my attention. Attention Billary Campaign Staffers: HIDE THIS POLL!! All five of the leading Republican presidential candidates — including John McCain — would beat Democrat Hillary Clinton in a head-to-head match-up, according to a surprising new poll from Zogby International. Romney outpolled Clinton by a margin of 43.1 percent to 39.9 percent; Thompson beat out Hillary by a similar margin, 43.2 percent to 39.6 percent; and Mike Huckabee bested Clinton by a solid margin of 44.3 percent to 38.5 percent. McCain, who trailed Clinton 45 percent to 43 percent in a July Zogby poll, has pulled ahead of the Democrat in the new poll, winning 42.1 of the vote compared to Clinton’s 37.6 percent. There was some bad news for those of us who live on the "right" side of the political and life spectrum. When the GOP hopefuls are matched up against Obama, the Illinois Democrat beats Giuliani by a margin of 46 percent to 40 percent, Romney (45.8 percent to 39.9 percent), Thompson (46.4 percent to 39.9 percent), Huckabee (45.8 percent to 39.6 percent), and McCain (44.8 percent to 38.2 percent. How it is a first term Senator from a rich family who attended private schools knows anything about what it means to be "middle class" or making decisions about a budget over a kitchen table. I also want to know about his early schooling at a madrassa in Indonesia. I mean, I am no conspiracy nut, but doesn't that sound a bit "Manchurian Candidate (ish)" to you? It was noted by the poll that "It shows that she’s slipping not only in Iowa and several other early caucus or primary states, but across the country as well." So, I think maybe someone needs to come back to reality. I have said this before, and I will say it to the end of this election, you can't get elected with these kinds of negatives.